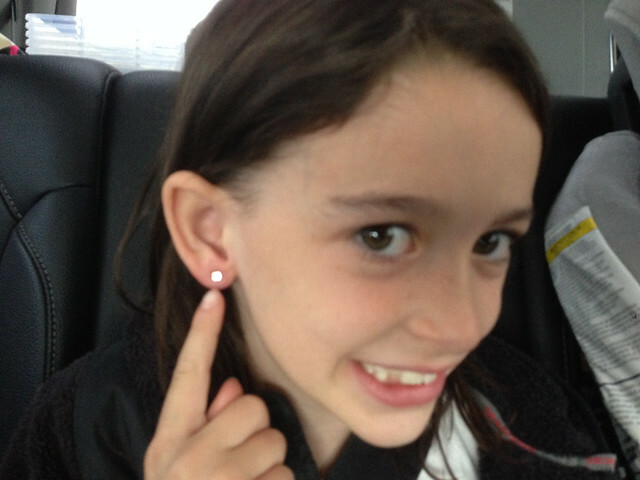 Reagan has been bugging me for a few months now about getting her ears pierced. As parents, we had a positive experience with Sydney doing hers so we dropped the resistance and tried to use this as a carrot for a few months to get some desired behavior. No whining was the mantra. Every time she did, I reset the clock. 30 days no whining! It was hard. She never really got it done. But I finally figured we had some free time today so we went over and got this done. She wanted Sydney and Mom to hold her hands. The excitement turned to nervousness as they process began. She had a bit more of a sting than Sydney had but she did great. I didn’t spend a second coaching her like I did with Sydney. I figured…if you want it, then deal. She dealt.